Lawn irrigation systems can benefit significantly from fall maintenance and winterization. 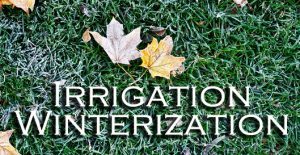 If you’re one of the many homeowners who own irrigation systems, Mike Lynch Enterprises can help you maintain and extend the life of your lawn irrigation system with proper irrigation system winterizing service during the fall season. The main reason for winterizing irrigation systems in New England is to keep them from freezing during our often harsh winters. Winterizing residential irrigation systems involves purging the system to remove any remaining water that could freeze and burst your pipes. Also at risk for damage to non-purged irrigation systems is the backflow preventer valve that is above ground, leaving it vulnerable to an early freeze. The process of purging irrigation systems is also called “blowing out” the system because pressurized air is pumped into the system to force the water out. Winterizing irrigation systems is not the only irrigation system service Mike Lynch Enterprises provides. Fall is also a great time to install irrigation systems – that way, homeowners have brand-new irrigation systems ready to go in the spring so they can get a jump on lawncare by promoting early root growth for a greener, healthier lawn in the spring and summer. Mike Lynch Enterprises installs irrigation systems in central New England all fall long, until the ground freezes. So whether you’re one of the hundreds of area homeowners who need to winterize their irrigation systems or you’re interesting in an irrigation system installation, now’s the time to call Mike Lynch Enterprises and schedule your irrigation system service or installation.